Grand Hyatt Singapore implements organic food waste management system, reducing waste production of the hotel and converts the waste into useable fertiliser. The hotel received a grant of S$250,000 through the 3R (Reduce, Reuse & Recycle) Fund for the installation and implementation of the system. The grant is calculated based on key outcomes such as the actual quantity of waste reduced or recycled. The 3R Fund, created by the National Environmental Agency, is a co-funding scheme to encourage organisations to undertake waste minimisation and recycling projects. This new organic food waste management system touches on the first and the third of the three focus points in Hyatt’s 2020 sustainability plans. • a ‘Rapid Thermophilic Digestion System’ which then converts compacted food waste into pathogen-free organic fertiliser. The ‘Rapid Thermophilic Digestion System’ subsequently recycles the compacted food waste into organic fertiliser and this will be used only for the hotel’s landscaping purposes. This innovative system enables the hotel to keep 100% of its organic food waste out of the city’s landfills – drastically reducing the property’s overall waste production and will be good for environment of the city. The hotel said that this will also boost productivity and hygiene levels, as food waste will be transferred into the integrated in-feed stations located at various dishwashing and food preparation areas, and transported via the vacuum system into the centralised grinder and dewatering unit. As a result, manpower is no longer required to physically move food waste into the waste compacters. About 55,000 trash bags will be saved each year, and this further contributes to the green efforts of this project which has an estimated payback period of less than 3 years. This new waste recycling infrastructure saves Grand Hyatt Singapore approximately S$100,000 a year in food waste haulage fees and operational expenses. By eliminating the need for food waste haulage, the hotel will further reduce its carbon footprint. Spearheaded by Executive Chef Lucas Glanville, this milestone achievement would also not have been possible without the dedication of Grand Hyatt Singapore’s Business Analyst Darrell Tan, Director of Engineering Ivan Leong, Stewarding Manager Vijay Sivarajah and the secretarial support of Anita Lukman. Food waste is created in Singapore every single day from our food cycle – production, distribution, retail to consumption – and the wastage is huge and still looming to become a problem for the country. According to the National Environment Agency, Singapore wasted approximately 790,000 tonnes of food in 2014 and it’s still looming to become a problem to the country. Typically, food waste would go to a landfill where it would decompose, or it would go to an incinerator. At the present, burning food waste is Singapore’s primary method of waste disposal which uses enormous amounts of energy to do. Singapore has only one landfill left – Semakau Landfill – and it is expected to run out of space if habits do not change. It has been reported that Singapore’s landfill will run out of space between 2035 and 2045, if the nation continues to dispose of more than three million tonnes of rubbish a year. Why is Singapore’s household recycling rate stagnant? SINGAPORE: For two years, Hougang resident Padmarani Srivatsan has been collecting raw food scraps – like vegetable and fruit peel – that she throws out from her kitchen, turning it into soil nutrients for her plants. Besides composting raw food waste, the 52-year-old kindergarten teacher has been recycling other waste that her household generates, including plastics, glass bottles, paper and tin cans. Doing all this requires a conscientious effort, said Mrs Srivatsan, acknowledging that it may be a challenge for many Singaporeans, who generate some of the most waste globally on a per capita basis, to follow her example. A 2012 World Bank report put the amount of Singapore’s per capita municipal waste generated at 1.49kg a day – on par with Hong Kong, but higher than South Korea. At the same time, the household recycling rate remained at around 20 per cent between 2005 and 2015 – and this is “quite low”, despite more than 15 years of the National Recycling Programme (NRP), according to Mr Eugene Tay, director of sustainability consulting company Green Future Solutions. When asked for an update on the NRP in Parliament this April, Senior Minister of State for the Environment and Water Resources Dr Amy Khor pledged that the Government will continue its efforts on public education, as “30 to 50 per cent of materials deposited into the recycling bins are not suitable for recycling”. According to the National Environment Agency (NEA), Singapore’s domestic recycling rate was 19 per cent in 2015, and the target is to bring this to 30 per cent by 2030. This is below other developed economies like the United Kingdom and Taiwan, where the household recycling rates in 2013 were 44.2 per cent and 42 per cent, respectively. While the rate is comparatively low, it is tricky to benchmark Singapore – a city-state – against other countries for two reasons. Firstly, different countries have different methodologies. Secondly, countries with significant agricultural sectors could have an outsized contribution to the domestic recycling rate through composting and anaerobic digestion. But the NEA does acknowledge multiple challenges to raising the domestic recycling rate. A key issue is the ubiquity of in-home refuse chutes, which public high-rise apartment blocks built before the late 1980s are fitted with. The convenience of the refuse chute poses a challenge to studies that attempts to find ways to increase the domestic recycling rate, said the NEA. Take a usage-based pricing scheme for example, where households pay according to the amount of waste they throw away and enjoy savings when they reduce their waste. According to the NEA, “a key challenge in its implementation” would be the use of refuse chutes in high-rise buildings, where more than 90 per cent of the population reside. Although HDB blocks built after 1989 are installed with a centralised refuse chute on each floor, and blocks built after 2014 will have an additional centralised recycling chute, it will take decades before in-home refuse chutes are entirely phased out and for the majority of HDB dwellers to have access to recycling chutes. In the meantime, environmental experts say more public engagement is needed to get people to segregate recyclables from their waste, and to put them in the blue recycling bins allotted to each public housing block. But even if residents put in the effort, the use of the blue recycling bins comes with its own set of problems. A challenge to boosting the domestic recycling rate has to do with the fact that some people are not sure of how and what to recycle, and there is confusion over where recyclables end up, said Mr Tay of Green Future Solutions, adding that some think that the recyclables end up in the incineration plants. A straw poll among five households who recycle shows that best practices are unclear even among those who make use of the blue bins. “Empty paper cups from McDonald’s – can these be recycled or are they considered contaminated? I’m confused over what can and cannot be recycled,” said Ms Chan Yen Sen, 38, who has been recycling for the last eight years. Ms Angie Woo, a home-maker from Newton who has been recycling for more than a decade, also noted that the recycling guidelines can be clearer. “When I travel and stay at AirBnb apartments in Australia or France, I notice the hosts would have very detailed and easy-to-follow guides on how to recycle – what to do, what not to do. We’re lacking this in Singapore,” said Ms Woo, who is in her early fifties. Confusion over the use of the recycling bins has led to their misuse as a general waste bin. According to the NEA, materials that have been deposited into the recycling bins include non-recyclables, like “pillows, soft toys and footwear” and unfinished food and drinks which contaminate the rest of the recyclables. While household recycling rates remain comparatively low, environmental experts say that legislation and punitive measures to change that trend may not be necessary. “Before we consider punitive measures, there is still room for improving our current education and engagement efforts. More effective and targeted outreach and communications are needed… to change mindsets and behaviours,” said Mr Tay, who also runs Zero Waste SG, an NGO which aims to increase waste minimisation and recycling in Singapore. Ms Rachel See, an environmental engineer with the Singapore Environment Council (SEC) agreed, adding that the effectiveness of legislation depends on ensuring that there are adequate resources in place. “Instilling knowledge and good habits such as recycling and proper waste segregation are essential, and a multi-pronged approach should be adopted to reinforce the importance of recycling in sustaining a healthy environment,” she said, adding that community involvement is key to making recycling a social norm. Beyond outreach efforts that appeal to people’s green impulses, the Government has also sought to change mindsets by appealing to people’s pragmatism. For example, the NEA has worked with public waste collectors to implement 90 “Cash for Trash” collection points, where residents can exchange recyclables for cash. It also jointly organises a “Green Homes” programme with the SEC and the North West Community Development Council to hand out awards to households that recycle and use energy-efficient electrical appliances. Green Home award recipient Mrs Rowena Artiaga, who lives in a four-room HDB flat in Segar, said the utility bill for her family of five comes up to just below S$100 a month. In comparison, data from Singapore Power show the average utility bill for a four-room HDB flat is around S$144. Besides recycling the usual materials – paper, plastic, metal, and glass – Mrs Artiago also makes the effort to reuse water. Water used to wash fruits and vegetables for example, can be collected and used to water plants. The family also rarely uses air-conditioning. “It’s proof that it’s not just for the environment. When you lead an eco-conscious lifestyle, it’s also cost saving,” said the 51-year-old home-maker. The paucity of discussion about waste in Hong Kong means that our city faces a refuse crisis that requires prompt and decisive action. Successive governments’ waste management strategies have been a failure and our landfills will reach capacity in the near future. We should look at what Singapore has achieved. It has done an excellent job dealing with its garbage problem, which poses no threat to marine ecosystems and uses some refuse for landfills. The Semakau Landfill is Singapore’s first and only landfill situated offshore among the southern islands of Singapore. It covers a total area of 3.5 square kilometres. It began operating in 1999 and is expected to remain in use until 2045, and this deadline may be extended if a variety of waste minimisation and resource conservation initiatives are implemented. It is mainly filled with ash produced by Singapore’s four incineration plants. The refuse is transported in covered barges. This prevents the ash from being blown away in the wind. Precautions were taken before the landfill was opened to ensure that the site is not foul-smelling and unhygienic and to protect nearby coral. There is regular water testing to make sure that all the precautionary measures implemented are still effective. I think Hong Kong can learn from Singapore’s successful strategy, with a balanced policy that prevents the landfills reaching capacity, protects marine life and guarantees further reclamation projects are possible. Reclamation is important for Hong Kong, with its large population. With reclamation projects, more land can be made available on which to build homes. 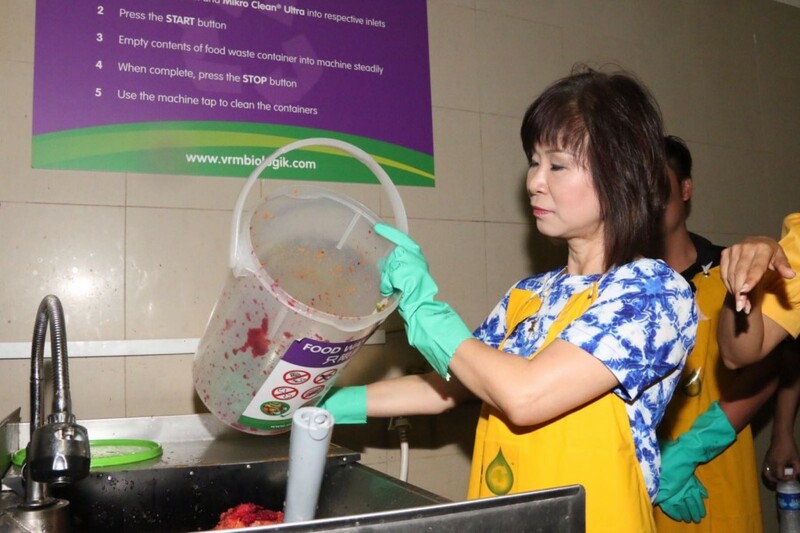 SINGAPORE: A two-year on-site food waste recycling pilot at two hawker centres, Ang Mo Kio Blk 628 Market and Tiong Bahru Market, was launched on Thursday (Jan 21). Eco-Wiz took about a week to train the cleaners and hawkers to sort the waste collected at the market. 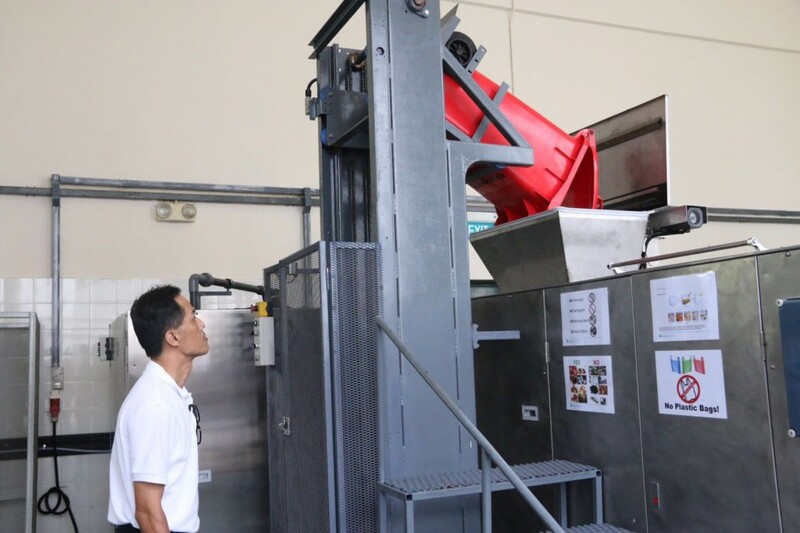 The machine at Tiong Bahru Market, under VRM Operations, grinds up food waste and mixes it with micro-organisms. The resulting mixture is stored on the premise in 15 1,000-litre tanks. When the tanks are full, they are transported off-site to be converted into bio-fertiliser for agricultural purposes. Vendors at both markets install and maintain the food waste recycling machines, as well as train cleaners and stall holders to segregate waste. VRM Operations said that getting cleaners and hawkers on board to separate the organic waste from other materials was not difficult after they addressed concerns raised by them. NEA and VRM Operations have been engaging the hawkers since May last year. Efforts were intensified in the November and December period when they went from stall to stall to speak to hawkers and taught cleaners how to segregate the waste. When the winning bids were announced in October last year, NEA had said that the markets were selected based on the number and mix of their stalls. 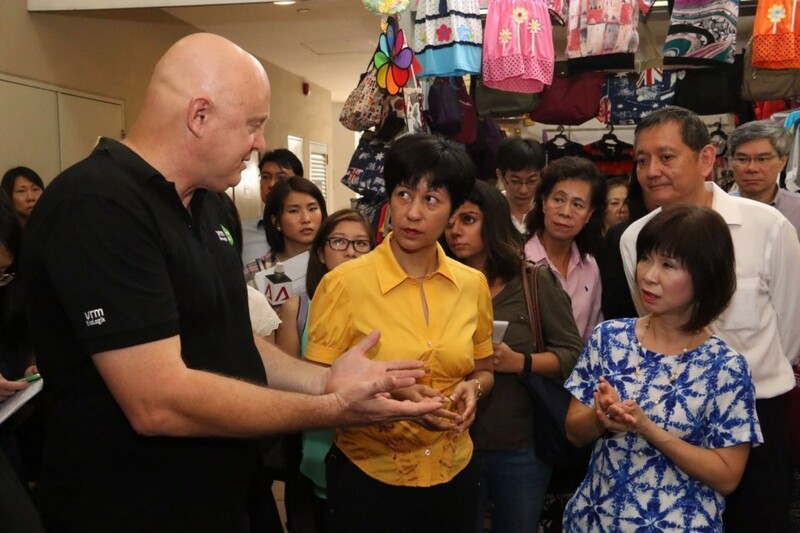 There are a total of 218 stalls and 342 stalls at Ang Mo Kio Blk 628 Market and Tiong Bahru Market, respectively. The pilot, which is expected to conclude in December 2017, is part of Singapore’s efforts to become a zero-waste nation under the Sustainable Singapore Blueprint 2015. Speaking at the launch, Senior Minister of State for Environment and Water Resources Dr Amy Khor said that apart from building up capability to recycle food waste, consumers have a part to play as well. “We are not just looking at recycling food waste but actually the best way to reduce food waste is not to create it in the first place,” she said. To that end, Dr Khor said that NEA has started outreach efforts to encourage members of the public to reduce food wastage at home. She added that the agency is also partnering with food retail businesses to redistribute excess or unsold food. Food waste accounts for 10 per cent of total waste generated in Singapore. In 2014, 788,600 tonnes of food waste was generated of which 101,400 tonnes was recycled. The remaining food waste was disposed of at incineration plants, according to NEA.